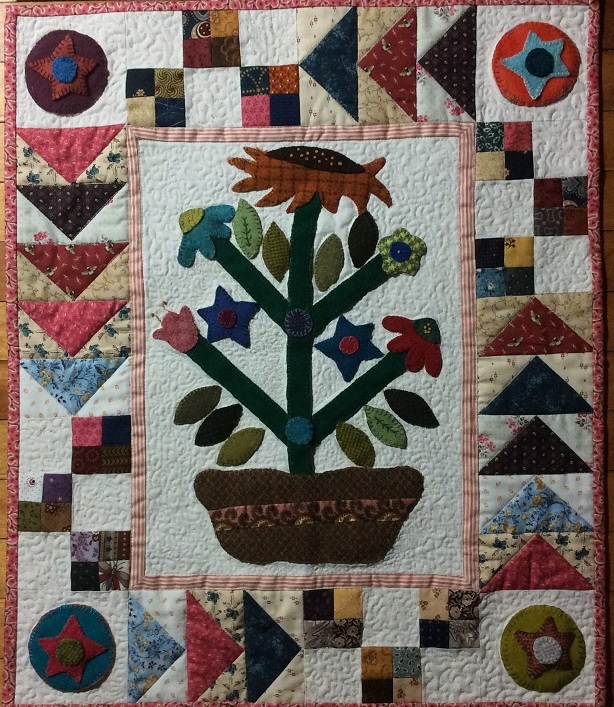 The Constant Quilter: A Little Wool Goes a Long Way - All the way to California! A Little Wool Goes a Long Way - All the way to California! A while ago, I told Randy (Barrister’s Block) that I love to collect wool fabric, but I rarely use it. Randy’s wool creations are wonderful and we decided it was high time I made something too! and this is Randy’s fabulous quilt. We both learned a lot in this little challenge. We both admitted it was a lot more wool work than we had anticipated. We both tweaked the pattern, but Randy's tweaking came out way better than mine. I LOVE the sunflower! I definitely got better as I went along, but I quickly realized that I really prefer needle turn cotton applique and I think I need to stop collecting wool! Thanks Randy for the nudge! I had a ball! We like to begin and end the year with a hike. The end of year hike was relatively short. We lost all our Thanksgiving snow due to rain and temps well above normal. However on Saturday the temps dropped to below 20 degrees and we were really feeling the cold. 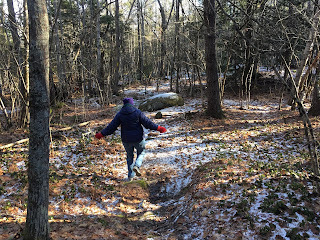 We hiked up to a ridge over the Kennebec River and listened to the ice coming down and crashing against the rocks. It sounded like a twenty car pile up! We thought about going down the hill to get a closer look, but were afraid we might not get back up the icy trail! 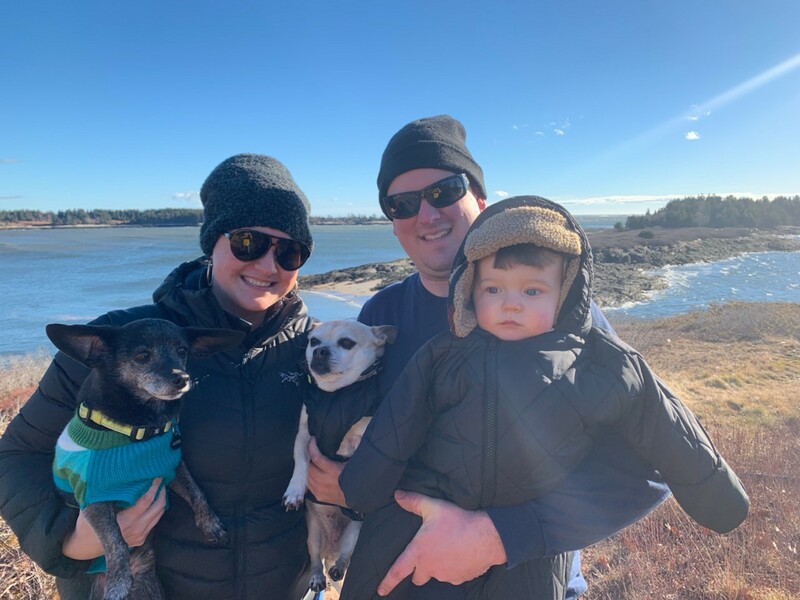 Our New Year’s Day hike was warmer but super windy. We walked to the end of our road with my daughter and her family and watched the surf. The swells were magnificent, but since the tide was out, it was hard to get a picture of just how high the waves were. Happy New Year! Sweet little quilts!! I love both versions! 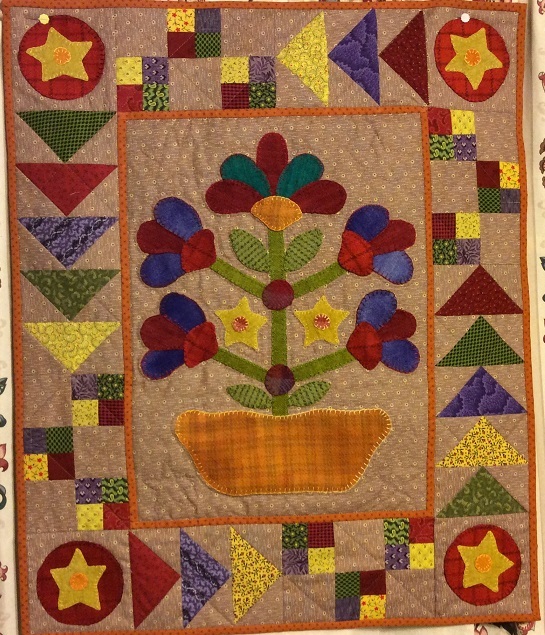 We had a lesson in wool applique at quilt ministry a couple months ago, and I quickly discovered I like cotton applique a LOT better, though I really love the pieces our teacher/fellow quilter has made. Your woolie swaps are so sweet. It's fun to see both versions. It would have been a brisk walk at -20°. I love seeing your different versions of the same pattern. Fun idea for a swap. They are both beautiful! Very sweet looking mini's. I love seeing similar but different quilts! So much fun to see the personality shine through! Interesting that working with wool takes more time than you thought. I had heard it was 'so much faster'! Great winter walk! I love both wool projects. I have an on going sue spargo wool project when I get the wool urge, but always return to cotton. You actually complete projects!! I like the look of wool but what little I tried, I quickly realized I was happy admiring the work of others. Both wool quilts are sweet as can be. I love using a bit of wool here or there in a quilt for texture. What a great idea - the hiking. A lot more healthy than the sitting around eating sweets ‘tradition’ I seem to have, ha ha. Happy New Year Wendy! Happy New Year! I love the idea of the walks to end and start the new year! And the walk down your road to the beach sounds divine-- although I could live without the below zero temps! I'm SO glad that you are happy with my version of our wool/pieced swap. It was really a great fun project and I'm so appreciative of your willingness to participate! 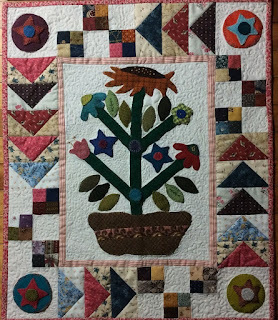 I love both versions of your sweet quilts and what a fun challenge. 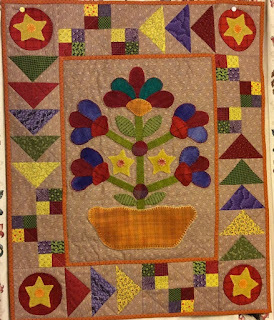 I didn't even know about combining wool applique with traditional piecing until this year. I've also been collecting wool, but not using it, so I think it's about time to try something! great quilts and what a nice trade with a friend. I went on a hike NYD at the sound and it was a wonderful way to start the year. I saw Randy's post before yours. How very interesting. Was the plan to tweak or it just happened that way? Love those little wool quilts. So sweet! I collect wool too but it just sits on my shelf . . . Going on hikes feels so good! Looking forward to another great year. Happy 2019! Congratulations Mrs. Sew and Sew - It's a Quilt!